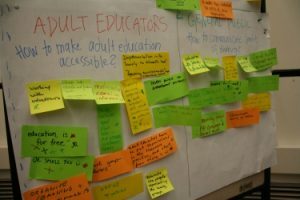 The ImplOED project aims at helping adult education institutions to develop successful outreach work, enhance empowerment of learners and increase diversity in adult education. The main resource for this purpose are the OED Guidelines for Trainers and Management Staff in Adult Education. OED Methodological Guidelines support managers, course designers and practitioners in adult education institutions in their daily work with socially and educationally disadvantaged groups as well as to raise awareness for outreach, empowerment and diversity programmes offered by adult education insitutions. The Guidelines are based on examples of good practice collected from 14 European countries. They reflect the experiences of adult educators working in the field and have the final objective to encourage a vital dialogue among all people who are dedicated to adult learning. encourage managing staff in adult education organisations to promote diversity in their organisations and to develop more participatory governance structures that include learners’ voices. Find the events near you and participate or let us know if you plan to organise your own event and activity.